Later, the article's author goes on to attend a party in another of Scarano's buildings: "'There’s a secret room,' [the party's host] told me, conspiratorially. Up on the mezzanine level, next to a pair of D.J.’s turntables, he knocked on a wall. It sounded hollow." 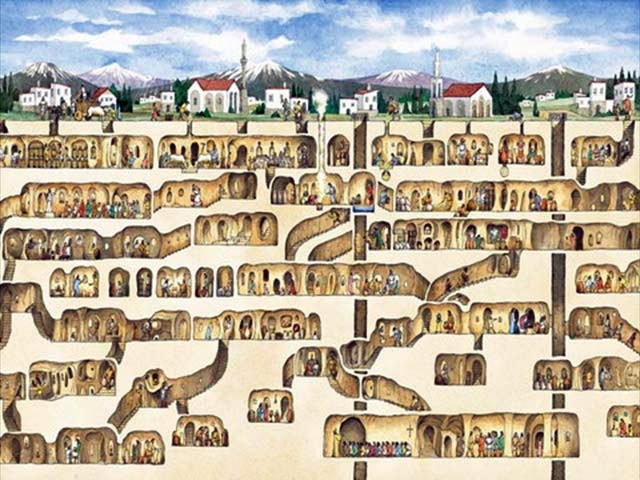 No one knows how many underground cities lie beneath Cappadocia. Eight have been discovered, and many smaller villages, but there are doubtless more. The biggest, Derinkuyu, wasn't discovered until 1965, when a resident cleaning the back wall of his cave house broke through a wall and discovered behind it a room that he'd never seen, which led to still another, and another. Eventually, spelunking archeologists found a maze of connecting chambers that descended at least 18 stories and 280 feet beneath the surface, ample enough to hold 30,000 people—and much remains to be excavated. One tunnel, wide enough for three people walking abreast, connects to another underground town six miles away. Other passages suggest that at one time all of Cappadocia, above and below the ground, was linked by a hidden network. Many still use the tunnels of this ancient subway as cellar storerooms. In any case, for Scarano it was not always about literally hiding extra rooms inside a building; it was often just a matter of using certain words—like basement—instead of others—like cellar—to hide his intentions. For instance, "Scarano tried to build a two-story addition to the roof of [an] old warehouse by transferring floor area from the building’s lowest level, which he planned to convert to parking, to the top of the roof. But the zoning code distinguished between a basement (which is partly above ground, defined as habitable, and therefore counted toward the floor-area ratio) and a cellar (which is underground and uninhabitable). Opponents accused Scarano of trying to finesse the difference, and eventually the Department of Buildings declared the space a cellar. New height limits have been established in the neighborhood, and the partly built addition is coming down." Or this: Scarano "adapted the zoning rules that applied to warehouse conversions. Under certain circumstances, the code classified loft mezzanines as storage space, not floor area, and Scarano assured developers their new building plans could slip through this loophole." It's hermeneutics—as if the spatial expansion of whole neighborhoods is really just a graph of certain words used in different contexts. As if vocabulary itself materializes, precipitating out as alternative spatial futures for the city. Indeed, the New York Times writes, "in Scarano’s view, the city’s code was a Talmudic document, open to endless avenues of interpretation. Through a variety of arcane strategies, he could literally pull additional real estate out of the air." I've long been a fan of David Knight and Finn Williams, two London architects with an encyclopedic knowledge of that city's building permissions and zoning codes (I highly recommend their book SUB-PLAN: A Guide to Permitted Development, as well as Knight's recent guest post on Strange Harvest). The following image, taken from that book, is just one example of the type of interpretation-based spatiality so often abused by Scarano. Whether or not hiding entire rooms behind drywall is part of London's "permitted development" is something we'll have to ask Knight and Williams. I'm reminded of an anecdote about a family that wanted to install a satellite dish, but their neighborhood covenants didn't allow them. They noticed that their convenants did allow sheds, so they put the dish in a backyard fiberglass shed---fiberglass being completely transparent to the satellite signals. Geoff back in March I wondered whether Scarano's approach could be considered a type of jam/hack of urban fabric. Hey Nam—absolutely. I think a creative engagement with zoning code is one of the most straightforward ways of creating compelling, site-specific urban architecture, going back, for instance, to the Hugh Ferris stuff in Delirious New York and even up to people like Bjarke Ingels today. Scarano's problem was that he seemed to be cheating the city for profit—not creatively bending the rules to reveal more exciting possibilities for architectural space. Geoff, yeah it is like the "evil" version of the work of folks who did the "Sub Plan" book, whom you have written about before.